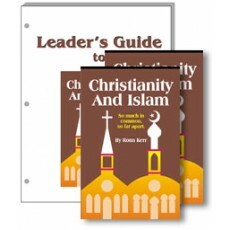 Christianity and Islam by Ronn Kerr is a unique new study for a unique time. Get this Sample Packet of two student books and the complete Leader's Guide for a full examination of our most popular adult study. Each of the thirteen sessions in Christianity and Islam covers a major area of the world's two largest religions, comparing and contrasting them in a way that brings greater understanding of each. Written for Christian adults and older youth that have little knowledge of Islam other than what they have seen in the news, this study aims at providing a general understanding of the differences and similarities between these two great religions. This popular study is divided into the following weekly sessions: 1. The World's Two Largest Religions, 2. Jesus and Muhammad, the Early Years, 3. Jesus and Muhammad, the Ministry Years, 4. Jesus and Muhammad, the Conflicts, 5. Apostles and Caliphs, 6. Schisms and Denominations, 7. The Bible and the Quran, 8. Pillars of Faith, 9. Religious Leadership and Worship, 10. Primary Theological Beliefs, 11. Culture and the Role of Women, 12. Violence and Warfare, and 13. The Future of Christianity and Islam. The extensive 100-page Leader's Guide is loose-leaf and 3-hole punched so that it can be easily distributed to various session leaders without having to make sure the Leader's Guide gets to the right person every week. The Leader's Guide contains substantial background material from the New Testament and the Quran as well as extensive text, leadership suggestions, and creative discussion starters for each session. This study was amazing. The class kept growing and we had to keep coming back to order more books. We used the PowerPoint shows and they made the teaching an easy task. Our people started without knowing anything about Islam except what they heard on the TV but, at the end of the study, they felt much better informed.